boneheads! If you want official bone head tweg, you are on the right page! We have great bone tree products are designed to pump up your personal groove and vibe…be a proud bonehead with this exclusive bone tree tweg (we made that word up). These items are now available at bone tree gigs. If you email us at bonetreeband@hotmail.com we could arrange a shipment to your home address…as some boneheads live far….far….away. Finally…we have official bone tree T-Shirts! Men’s and women’s sizes in white, pink, sand, or blue with a large, single color black, silk screened bone tree logo on the front. Made of 100% preshrunk cotton, these are high quality shirts you will be proud to wear at bone tree concerts, weddings, graduations…anywhere. Beautiful, ceramic coffee/tea/soup/drink mugs. Show off your bonehead pride with one of these at your office or in the kitchen! Black, ceramic mugs, white on the inside. With official white bone tree logos adorning them. They also say “deep canyon music” under the logo…a perfect conversation starter! These mugs are black glazed on the outside with white logos on the front AND back….and have a white interior glaze. 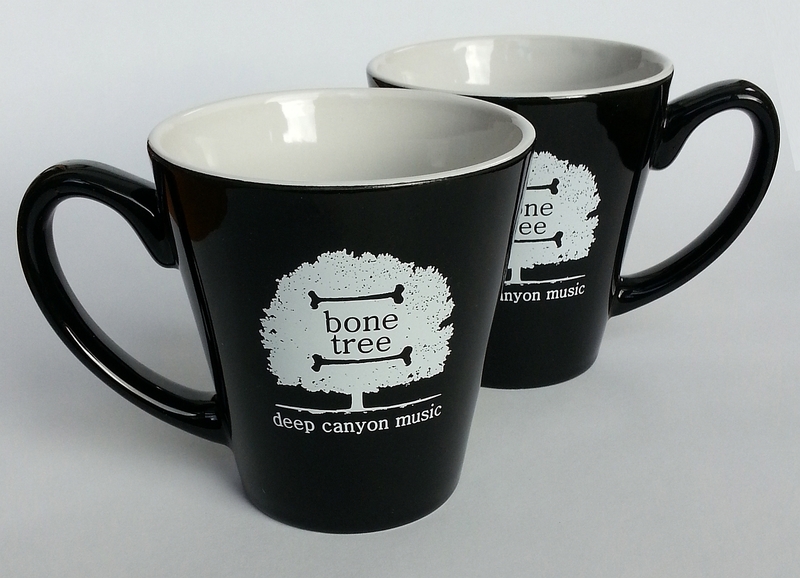 the bone tree logo is printed in white on BOTH sides of your mug…so you can identify it from almost any angle. Child safe. Adult safe. Dishwasher safe. Corrosion resistant. Legal in ALL parts of the USA. Can be used as gifts and in all formal settings. Please note that the bone tree mug is designed to work in ALL weather conditions including hurricanes, tornadoes, drought, cold, heat, etc. and can be taken into outer space. They are leak proof and strong enough to hold any liquid. These bone tree water bottles are perfect for…water! THey work with most liquids including iced tea. These bottles are clear/translucent (very) soft vinyl bottles with a black bone tree logo on them! The lid and nozzle are made of some sort of plastic…not sure what kind. But rest assured, it is very, very nice plastic. Unlike the bone tree mugs (above) the logos on the water bottles are only printed on only ONE side (we think it’s on the front). 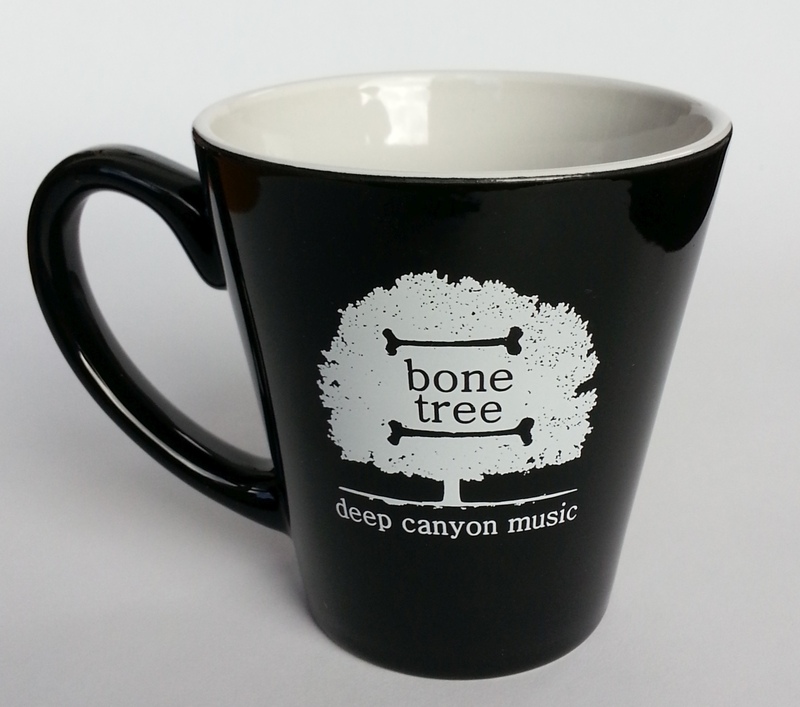 The logo includes the ever popular “deep canyon music” blurb which is always an instant conversation starter…just like the exact same blurb on the mugs! Remember: these water bottles are better than most because they make people think. Prices include tax but not shipping! Shipping will be calculated based on your address. Let us know where you want them shipped so we can figure this out.